DE BAKEY 120-0112 0.5mm ..
1- BLOW PIPE 2- 3 PCS. SCALPEL 3- DISSECTING FORCEP 13 CM. 4- GROOVED DIRECTOR WITH TONGUE TIE 13 CM..
2- 2 PCS. 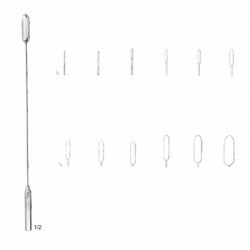 SCALPEL S.S. 3- GROOVED DIRECTOR WITH TONGUE TIE 13 CM 4- MAYO HEGAR NEEDLE HOLDER 13CM 5-..